Macroalgae can inhibit resilience by overgrowing and killing coral colonies, and by producing toxic chemicals which can kill corals or limit coral recruitment by lowering coral fecundity, settlement rates, and post-settlement survival. Herbivores help keep the substrate free from algae so that coral recruits can settle. When herbivores are not present, faster growing macroalgae can overgrow corals. This deprives corals of essential sunlight which can cause declines in coral condition and cover, and reduces the space available for coral settlement. This can result in a phase shift. Herbivores help to regulate community structure and function in many ecological systems. In addition to regulating and influencing the competitive interactions between corals and macroalgae, herbivorous fishes and urchins are also agents of bioerosion. For example, parrotfishes excavate the surface of the reef matrix or living coral as they feed, and the material is processed by their jaws, reduced to sediment and expelled back into the system. Such processes on coral reefs play an important role in maintaining the balance of reef growth and decay. Bioerosion contributes to reef recovery by removing dead coral and cleaning areas of substratum for colonization by benthic organisms, facilitating the settlement, growth, and survival of coralline algae and corals. 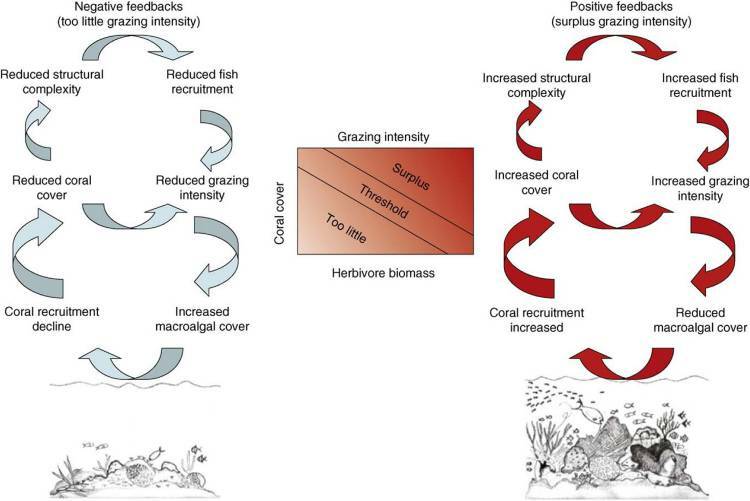 Feedback loops that produce the “biotic death spiral” versus the resilience of a healthy coral reef. The biotic interactions producing positive or negative feedbacks that drive a reef toward either an unhealthy state of seaweed dominance, with declining corals, fishes, and structural complexity (left side of image), or toward a resilient healthy state of coral dominance, with few seaweeds, many fishes, and a high structural complexity formed by coral growth (right side of image). Rate of herbivory is the critical interaction determining whether the feedback is positive or negative. Source: Mumby and Steneck 2008, Hay and Rasher 2010. In an experimental manipulation of large herbivorous fishes, Hughes et al. 2017 tested the influence of herbivores on the resilience of coral assemblages. ref The experiment was undertaken on the Great Barrier Reef after the regional-scale bleaching in 1998 within a no-fishing reserve where coral abundances and diversity had been sharply reduced by bleaching. In control areas, where fishes were abundant, algal abundance remained low, whereas coral cover almost doubled (to 20%) over a three year period, primarily because of recruitment of species that had been locally extirpated by bleaching. In contrast, exclusion of large herbivorous fishes caused a dramatic explosion of macroalgae, which suppressed the fecundity, recruitment, and survival of corals. Consequently, management of fish stocks is a key component in preventing phase shifts and managing reef resilience.